Roller Coaster – an amusement ride developed for amusement parks. A specialized railroad system, a roller coaster consists of a track that rises in designed patterns, sometimes with one or more loops that briefly turn the rider upside down. Most roller coasters have multiple cars in which passengers sit and are restrained. New Texas Giant (video 4:22) at Six Flags Over Texas. Steel-hybrid roller coaster – height of 153 ft (47 m) which features a 79° drop of 147 ft (45 m), and turns banked up to 95°. The Texas Giant isn’t a purely wooden roller coaster. The redesigned ride is a steel-tracked coaster with the original wooden support structure. Greezed Lightnin’ (video 1:42) at (then-Six Flags) Kentucky Kingdom. It originally opened in 1976 at Six Flags Great America as Tidal Wave. In 1991 it closed and re-opened 4 years later as Viper at Six Flags Over Georgia. In 2002 it was removed and sent to Kentucky Kingdom and named after its cousin that used to be at Astroworld. NOTE: The special shape of the loop – it isn’t round. 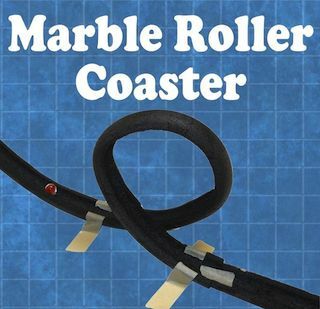 Marble Roller Coaster – build 20′ long roller coasters. Instructions, pictures. Watch the video (0:20) to see some examples. What are some of the basic physics concepts that are applicable to roller coaster construction, including potential energy, kinetic energy, and momentum? Where did you see these in action in your roller coaster? Through building, testing, observing and revision, what problems did you solve in your roller coaster design? What was the “fix”? What are some suggestions successful roller coaster construction? Roller Coaster – Built in 1927, the Cyclone Roller Coaster, was among the first and the most popular coasters in the U.S.
clothoid – a section of a spiral in which the radius is constantly changing. Unlike a circular loop in which the radius is a constant value, the radius at the bottom of a clothoid loop is much larger than the radius at the top of the clothoid loop. Amusement Park Physics – The thrill of roller coasters is not due to their speed, but rather due to their accelerations and to the feelings of weightlessness and weightiness that they produce. Simple machines – A machine with few or no moving parts. Simple machines make work easier.. Simple machines can be used alone. Complex machines use two or more simple machines together. inclined plane: A sloping surface, such as a ramp. An inclined plane can be used to alter the effort and distance involved in doing work, such as lifting loads. The trade-off is that an object must be moved a longer distance than if it was lifted straight up, but less force is needed. January 14, 2015 February 19, 2016 ..